TAMPA – For the first time since January 19 the Lightning were at the friendly confines of Amalie Arena. Alas, Vegas played homecoming spoiler. Alex Tuch’s shootout goal in the third round was the only one of the shootout and lifted the Golden Knights to a 3-2 come-from-behind win over the Lightning on Tuesday night in front of the customary 19,092. Thanks to the work of Andrei Vasilevskiy, who had 35 saves, the Lightning were able to salvage a point. The goaltender came up with a number of highlight-reel saves, none prettier than a series of stops he made against Cody Eakin and Max Pacioretty, a sprawling left to right beauty on the latter, with a little more than 14 minutes remaining in the third period. Vasilevskiy came up big in the game’s first few minutes, including on point-blank opportunities by Reilly Smith and Tuch. 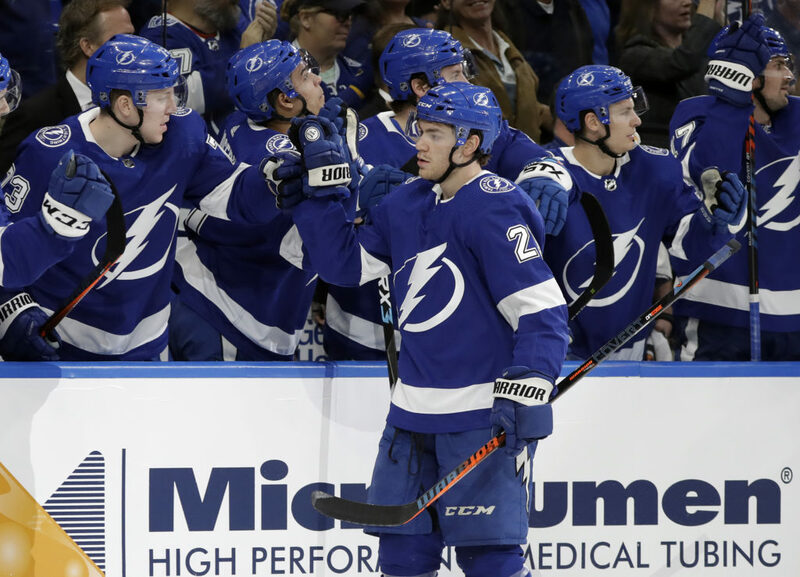 The Lightning then struck first when Brayden Point, returning to the lineup after missing Saturday night’s game in New York against the Rangers with a lower-body injury, put home a powerplay goal. Nikita Kucherov’s shot was blocked by Brayden McNabb with the rebound coming to Point, who from just inside the right faceoff circle put the puck over Marc-Andre Fleury’s right shoulder for his 31st goal, 14th on the man advantage. “It was nice, the puck just kind of laid there for me,” said Point. The Lightning took a 2-0 lead at 14:19 of the second period on a Mathieu Joseph goal, which was initially waved off because Joseph made contact with Fleury. Cooper challenged the call, which was overturned giving the rookie right wing his 13th goal of season. Vegas got on the board a little more than two minutes later thanks to a gorgeous pass by Jon Merrill, who from behind his own net found Eakin all alone on the Tampa Bay side of the neutral zone. Eakin broke in alone and wristed a shot through Vasilevskiy’s five hole. The Golden Knights tied it at 2-2 on a pretty give-and-go between William Karlsson and Valentin Zykov with the latter scoring his first goal of the season at 5:22. Not on Tuesday night, though, and the two goals were enough for Vegas to force overtime where they had 18 seconds of powerplay time carry over from the third period and when the Lightning were called for too many men on the ice at 2:38. Thanks to their time on the man advantage the Golden Knights had all six shots in the extra session with Vasilevskiy equal to the task, including a stop on Nate Schmidt’s blast from the right point with 15 seconds left. A three-game homestand continues Thursday night against the Blues and concludes Saturday night against the Penguins.